Designed to last for multiple changes. 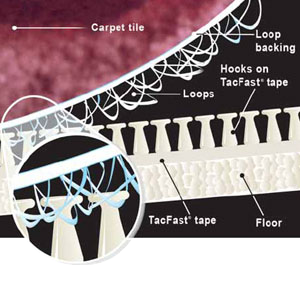 Use the hook tape for repeated changes of the carpet tiles. Remove or replace the carpet tile at any time easily and without cost or mess. Easy access to the floor. Access the sub-floor as necessary for maintenance, renovation or to clean the carpet tiles. Eliminate using liquid adhesives in installation with the consequent reduction in VOC emissions. Replace heavy traffic areas as required saving on the need to change the entire floor area. Make multiple attempts during installation without compromising the carpet tile.